The intensely raw sound of Mission Of Burma is just as impactful today as it was on the heels of their stellar 1982 release VS. Everyone knows the story by now, they broke up, stayed broken up for twenty or so years, then reunited in the early 2000’s picking up right where they left off with 2004’s OnOffOn. They’ve since been playing festivals, recording records, and as a whole making up for lost time. 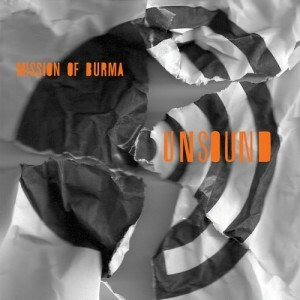 Burma’s latest record Unsound is spacier and a little more gruff then their past releases, no doubt a result of being recorded in their practice space as opposed to a traditional studio. I think that’s what I enjoy most about Burma, they know what they like to do and they do it. Having the guts to make a record that way takes a lot of confidence, confidence they no doubt compiled after dropping everything in their “normal” lives to go back to the grueling life of a musician and fortunately not falling flat on their collective faces. A few songs on this record really stood out to me, one being “Second Television” which has an almost Yo La Tengo-esq feel to it at the beginning but soon bursts into the cadenced shouting we’ve come to expect from Burma over the years. Another track I really enjoyed was the ironically named “Opener”, ironic, as it’s the last song on the record. This track really spoke to the guitar geek in me as Roger Miller tears off some seriously awe inspiring riffs, leaving nothing behind as the record comes to a close. And though it’s a relatively short song it seemed to sum up the classic sound we’ve all grown accustomed to over the years. In the end Unsound gets filed away just as every other Burma release has thus far and that’s as utterly satisfying, delivering me everything I’d hoped for and much, much more. I know that sounds cliché but honestly Burma has yet to let me down. Every single record, every single time, they’re perfectly on point by being perfectly imperfect. Kicking out the same brilliant brand of Post-Punk they started crafted back in the late 70’s while adding a hint of difference with each album that passes. I’m not sure how many more records they have left in them but if I had to guess I’d say they’re far from done, and I couldn’t be happier feeling that way.